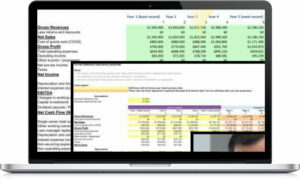 According to the company’s homepage, ValuAdder Business Valuation Software is useful not only for business owners but also for professional advisers, buyers and investors. In this review the focus is, of course, on the business owner’s needs. 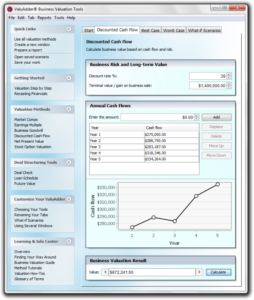 ValuAdder’s business valuation calculator software is only available for purchase and it needs to be downloaded and installed on the computer. The report builder needs to be purchased separately. Unfortunately, ValuAdder does not provide a free trial, so the review is based on the company’s own presentation of their product which can be found on their website. ValuAdder’s software system provides all kinds of business value calculators for different purposes. Business Sales Comps Tool uses valuation multiples approach to estimate the value of the company. The multiples are statistically derived from comparable business sales by industry sector and the value for the business is given by comparing it to others in the industry. It is not mentioned which database the tool is using. After selecting the business type the user must enter the business’ financial parameters such as revenue, cash flow, inventory, and assets. 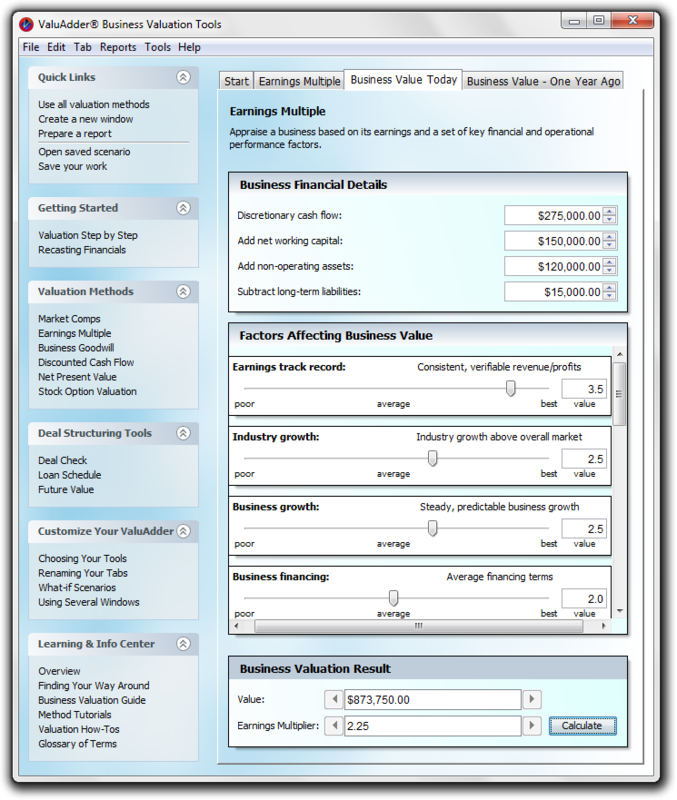 ValuAdder then calculates the business value range, average and median values. 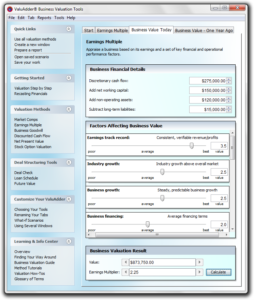 Earnings Multiple Tool is an income-based business valuation method. 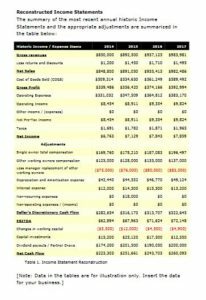 It estimates the business value based on its discretionary earnings, working capital and long-term liabilities, and 14 financial and operational performance factors, e.g. industry growth prospects and customer concentration. These factors are estimated on poor-best-scale. After the data is entered the tool calculates what the business is worth. Instead of detailed financial data, this tool considers the sensitivity of value drivers, such as customer base concentration and product mix. 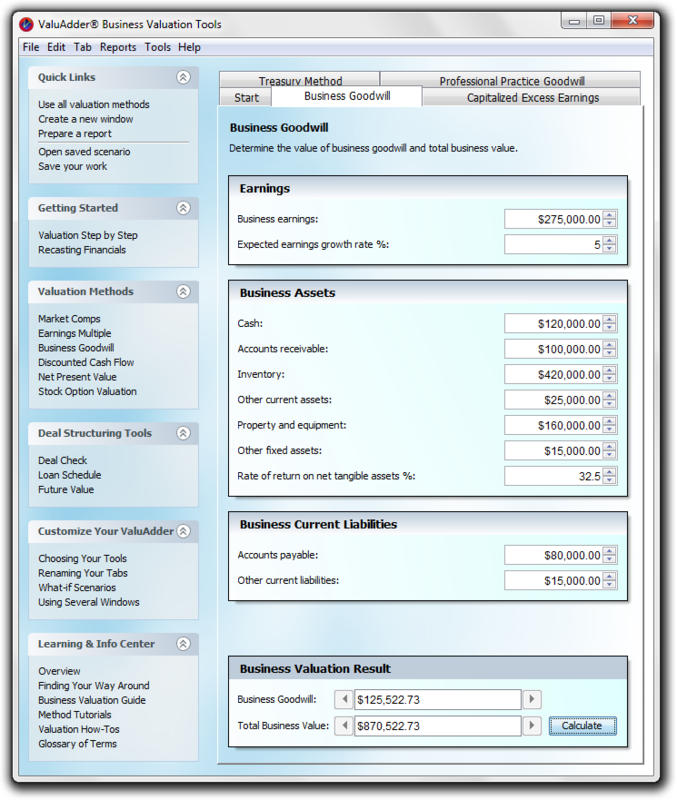 Business Goodwill Tool estimates the total business value as the sum of goodwill and net tangible asset value. It seems that ValuAdder uses Capitalized Excess Earnings method to measure the value of business goodwill. Based on ValuAdder’s own presentation it is not clear what data the user is supposed to enter. 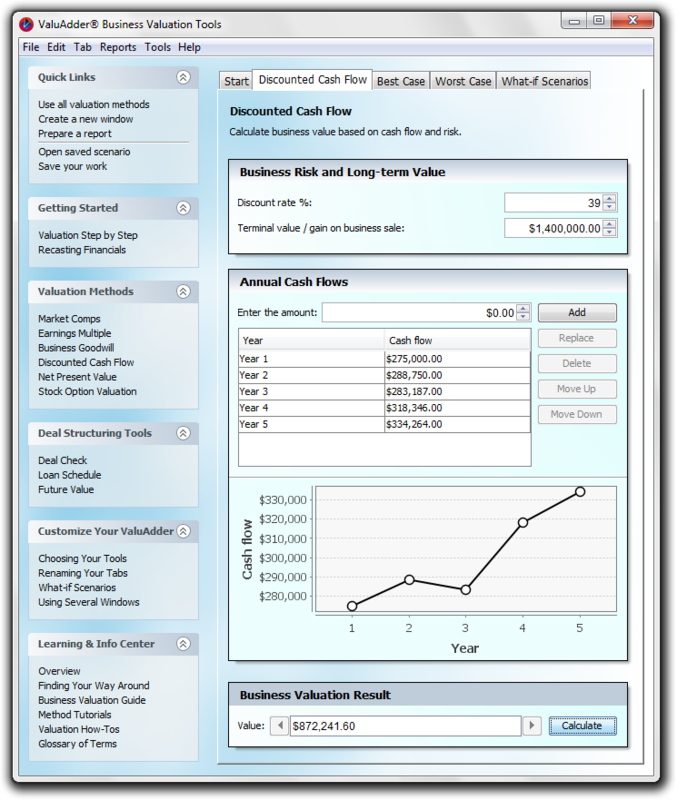 Discounted Cash Flow Tool calculates business value based on future cash flows and risk. To use it the user needs to provide the following inputs: Business earnings forecast, discount rate which captures the company’s risk and business terminal value at the end of the earnings forecast period. The cost of purchasing a business is not limited to the selling price of a business, but there are also additional transaction costs. Deal Check Tool allows the buyer to ensure that the business generates sufficient cash flows to support the deal terms. A calculator which uses an internationally accepted model to value employee stock options. It considers the important factor of stock volatility, in addition to other parameters. The tool also allows testing for different scenarios, to adjust for sensitivity for dividend rate changes, for example. Allows the user to make calculations to support financial decisions, such as taking a new loan or selling an asset. It helps in calculating the appreciation of assets and in creating an amortization table for loans. 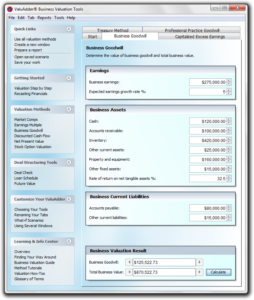 The ValuAdder report builder must be purchased separately. 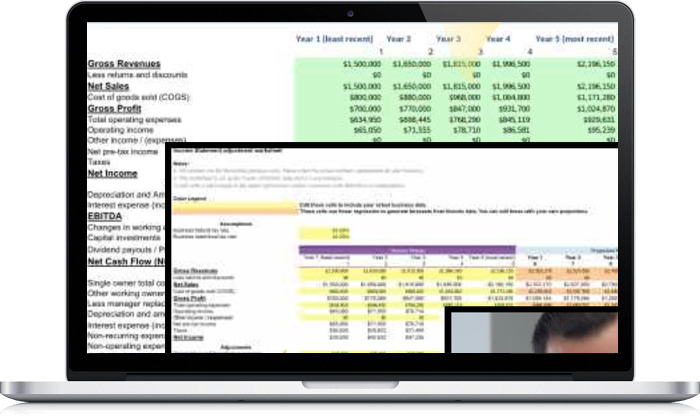 Because a free trial was not available, it was not possible to test how ValuAdder’s report builder works. However, a sample report is provided and it seems to allow for detailed reporting. Data and estimates are represented in clear numerical tables accompanied by written comments. ValuAdder Business Valuation Software uses different methods and for each the results are presented separately and in a detailed manner. 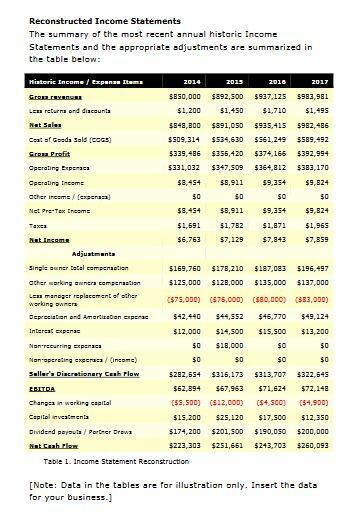 They are also presented collectively in a summary table, which makes it possible to compare the estimates. It seems that the valuation report is designed so that a business owner can use it in negotiations. It can be edited in Word format. ValuAdder uses a wide range of valuation methods, including the most important DCF and valuation multiples methods.